Sound therapy, though long established in ancient healing traditions, has seen a rise in popularity over recent years and is set to be one of the major “wellness” trends for times ahead. inventor and engineer who discovered the rotating magnetic field. With the recognition that external sounds can influence the internal matter, i.e. our bodies, and knowing that each part of our body has its own natural resonance, sound therapy is based on the idea that disease, disharmony or misalignment of the body and its processes is the result of those resonances getting out of tune. This could be because of stress, illness, environmental factors or a multitude of other contributions. Within the scientific studies of the perception of sound, psychoacoustics, researchers have examined how sound can be used as a healing modality or elicit a response from the brain, such as the way it absorbs information, controls mood or sleep patterns, engages a healing response, or even generate specific neurotransmitters, such as serotonin – one of the sleep hormones. The “healing” aspect of sound or vibrational therapy occurs when different frequencies of various sounds are played, which correlate to the sound frequency needed by the body to bring it back into balance – allowing the necessary healing to take place. While this can be specific to certain ailments, the healing can also be experienced as the deep state of relaxation, similar to that of a deep meditation, that is experienced when the body attunes to the various frequencies via the brainwaves. Though vibrations are used in Western medicine in the form of ultrasounds, these vibrations are highly focused and fast. The approach for sound therapy is more gentle, allowing the body to naturally, but equally as powerfully, return to its own resonance and state. As a healing modality, sound therapy is completely natural, gentle, non-invasive and requires minimal effort on behalf of the participant! Sound frequencies enable shifts in our brainwaves using a process called entrainment – which synchronises our fluctuating brainwaves by providing a sole, stable frequency to which the brainwave will tune into. Allowing us to alter our brain frequency. The frequency is the tool which influences the shift of our brainwave states, so we are able to transition from our normal beta state (regular waking consciousness) to alpha (relaxed consciousness), theta (meditative state) and delta (sleep state; where deep healing can occur). 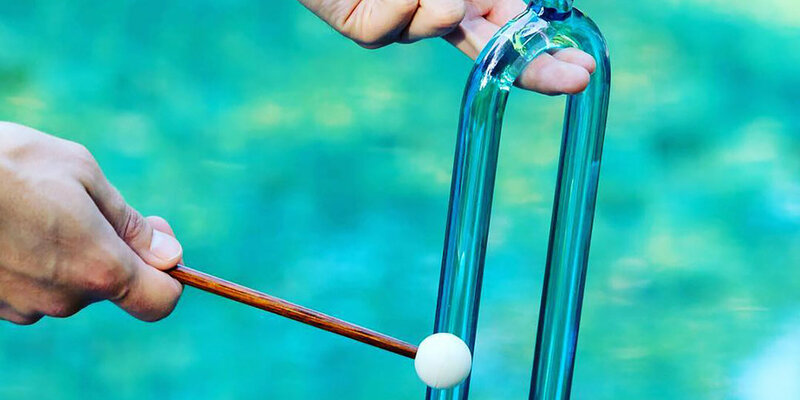 These sounds of vibrational therapy can be presented to the body through variously attuned instruments, most commonly it will involve the gong, singing bowls, crystal bowls, tuning forks, didgeridoo, RAVAS, or even the voice. There are various mediums in which sound therapy is performed. Sound Therapy is commonly performed in a private, 1-1 style format with a sound healer conducting a personalised attuned session for the individual needs. 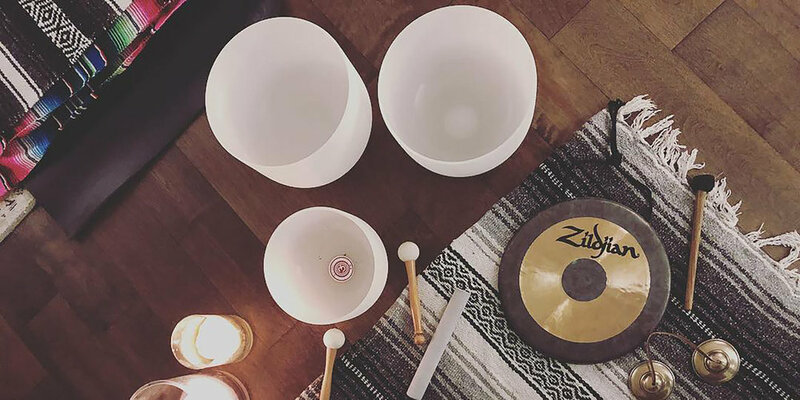 Another medium on the rise, are “Sound Baths”, in which participants attend a set class, commonly held at Yoga or meditation studios, where a practitioner will perform the sound healing for all attendees. Generally, this will be a passive activity for those coming to the class – no more strenuous than lying down for a restful meditative nap! Other times sound therapy can be infused into Yoga or mindful movement practices, such as Kundalini Yoga, Yin or specific sound therapy movement workshops. To understand how sound can be a modality used for healing, it is important to first gain knowledge of the functional state of our brainwaves. Our thoughts, emotions and behaviours are all brought about by the communication between neurons. This communication generates electrical pulses from the masses of neurons engaging with one another – our brain waves. These brain waves are sub-divided into five different bandwidths, which are thought to form the spectrum of human consciousness. Gamma waves are the most recently discovered and in terms of research, there is little known just yet about the fastest frequency of the five bandwidths. Understanding so far is that they are associated with bursts of insight, high-level information processing, cognitive function, learning and memory. On the flip-side, too much of this high processing state could lead to anxiety, stress and high arousal. Beta brain waves are most commonly associated with the brainwave state we are in when awake. The most common brainwave state to be in. They are our normal waking consciousness and are often related to logical thinking, critical reasoning and alertness. In the correct level, they allow us to focus and are effective for our general functioning, with a stimulating effect. On the flipside, too high levels of beta waves can be related to stress, anxiety and a sense of restlessness. Many may associate Beta waves to the tone of the harsh, inner critic. The alpha brainwaves span the gap between conscious thinking and the subconscious mind. Alpha waves calm you down when needed and promote feelings of deep relaxation. 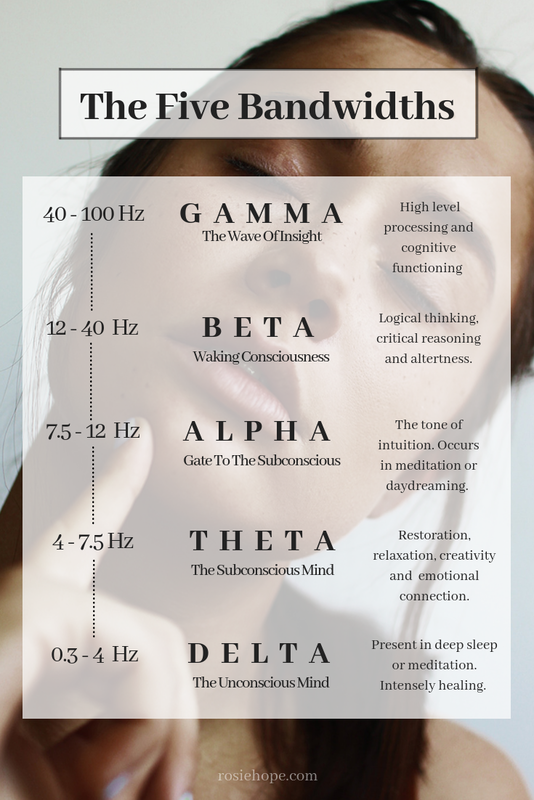 As the link between the beta and theta states, Alpha waves are considered the gateway to your subconscious and are present in relaxation states such as meditation or daydreaming. Said to heighten imagination, visualisation, memory retention, learning, concentration, Alpha waves are linked to the tone of your intuition, especially the closer you get to 7.5 Hz. Theta brainwaves present a deep meditation or sleep state, including the all-important REM sleep state. On the realm of the subconscious, between delta and alpha waves, this daydreaming and sleep range is relayed as deeply relaxed and semi-hypnotic. Theta waves are involved in restorative sleep – a requirement for overall wellbeing. Much of our deep-rooted programming exists within theta waves and when in this state, experiences of vivid visualisations and mind programming may take place. The theta waves can enhance our intuition, creativity, emotional connection and sensations of relaxation. The slowest of the five bandwidths, Delta brainwaves are experienced in deep, dreamless sleep or within practices of transcendental meditation, where awareness is fully detached from the individual. Delta waves exist within the realm of the unconscious mind, and it is thought there may be some links to unconscious bodily functions too, such as the heartbeat and digestion. As deep sleep is crucial for optimal healing, an experience in delta states is exceptionally restorative and rejuvenating. Delta waves are most readily present in infants and young children, with us naturally resonating less as we age, however healing with delta waves can assist in boosting health, strengthening the immune system and mood. You may recognise awaking from a delta focused sleep as you feel refreshed and restored. What can sound healing assist with? Then there are binaural beats. Widely considered to be an ‘auditory illusion’, a binaural beat means it relates to both ears. This is the phenomenon of playing a tone with slightly different frequency into your left and right ear, which the brain then processes to have a third beat at the difference of these two frequencies. It is this “third” frequency that the brain will attune to, via entrainment, for the sound healing to occur. For example, you may play 80Hz in the left and 90 Hz in the other. As these frequencies travel separately into the area of the brain that receives auditory input, they merge together and slowly the brain attunes to the difference between the two, creating a new beat, at a new frequency – in this example, it would be 10 Hz. For the binaural beat to occur, the two tones have to have frequencies less than 1000Hz and the difference between the pairings need to be less than 30Hz. The frequencies need to be listened to in each ear (easily done via headphones) and from there, you can decide on the frequency you desire for the brainwave entrainment. Suraya Sam of Ascend Yoga Therapy is an intuitive healer and incomparable sound therapy facilitator. The sanctuary space she has created offers a vast array of sound healing sessions, either as stand alone workshops or paired with Yoga flows. online: check out “White sun Music” on spotify. Dec 14 What Is Smudging? Dec 13 What Is Smudging?